Wow can you believe it’s the end of February already – this year is just flying by so fast. So many good things are happening too. I’m excited to see what the rest of the year brings forth. One of my good friends had a well-earned night out at the weekend. She drank several large glasses of wine and ended up a little worse the ware, saying things she didnt mean to friends who perhaps shouldn’t have taken them as said but were also in an equally inebriated state. Why do I mention this I hear you ask? Well the truth of the matter is it got me to thinking. We all make mistakes – whether that’s getting too drunk and mouthing off, getting ‘foot-in-mouth’ syndrome at inopportune moments or just general mistakes. We all make them at the end of the day, and anyone saying they don’t is quite simply telling untruths. The important thing to remember however, is that whatever mistakes you make it’s never too late to recognise them as such and make efforts to recover from them, accepting said mistake for what it is and moving on, working to not make the same mistake again and even helping others understand how it happened in the first place. Sometimes this recovery can be hard – there’s a famous saying by someone who’s name slips my mind that ‘nothing ever worthwhile is easy’. This is very true. And the coffee comment in the title – well as a writer, I rely on the warm, smooth taste and heat to keep me company when I’m stuck in my office writing. I’m one of those people who can’t write to music – it distracts me. So I fill my coffee mug, leave plenty of water in the kettle for refills, and let the heat and caffeine ignite my mind and assist me in my work. It’s a tried and tested method trust me! In the time since my last blog, I have tried to keep you keen readers updated by my facebook page, K A Richardson. But to recap for those who haven’t already liked said page (hint hint), Book 1 is currently in the stages of being edited – I have sorted the structure, headings and chapters, and have so far edited the first three chapters and prologue. It’s a hard slog looking at ones work with a critical eye and I was most pleased to have read the whole thing prior to editing as I’d written things I’d completely forgotten about! I will naturally keep you all updated as things progress but have also been doing intensive research for book 2 which so far is about 14k words. To me, a writer is being able to write the events as realistically as possible, with correct attention to detail, but also make sure the reader is taken care off if something is triggered. Book 2 broaches sensitive subject matter, and I am working hard to ensure that there will be little issue with how I want it all portraying. As always, thanks for reading this blog and keep up to date with my daily writing via twitter @kerryann77 and my facebook page as mentioned above. Keep smiling people – it’s almost spring! This entry was posted in Blog Posts on February 25, 2013 by Kerryrichardson77. Things that make me smile…..
Well I returned late last night from my short ‘nana holiday’ with National Holidays – yes it is a long time on a bus to Belgium, but we still had a wonderful time. The weather was freezing – one day there had been rain overnight and the rain had frozen solid on the footpaths – to say it was like a skating rink is an understatement! The older folk opted to stay in the hotel, but me and Pete decided to brave the ice, and the still falling frozen rain, and pop to the local shops for a wander. We were slipping and sliding, and giggling like little kids as we held each other up. It was a lovely morning. One of the organised trips was to Brugge – neither of us had ever been so we were looking forward to it – and it didn’t disappoint. As a city, the centre is widespread and full of little boutiques and shops, and the best bit? The chocolate shops! There was loads of them! Mostly down little cobbled back streets ten to a street. The prices varied in each, some exclusive like Godivers (like ten euro for one small box of chocolates) and others were reminiscent of small deli’s dealing only in chocolates handmade on site. Obviously we had to buy some for presents (and maybe one or two for us) – the smell was absolutely fabulous! If I could’ve bottled it and brought it home I would have. One of the other things I loved about Brugge, apart from the fantastic architecture, was the swans. They were on every canal and waterway in great numbers – random fact about Brugge – it’s illegal to feed the birds! How strange that you can’t throw the sandwich crusts to the ducks and swans! I did manage to get some writing done also – managed a little under 3k words which leaves novel two well and truly in the starting zone at just under 11k. I’m loving how the characters are developing – the more I write the more I’m getting to know them. You guys are going to love Jacob – phew he makes me swoon just a little and I created him! I’m writing in a similar theme to book one – the antagonist is ‘he’ when it’s time for him to feature. I’m also playing with titles now too – initial thoughts are this one will be ‘I’m watching you’ however this is open to change. Editing of With Deadly Intent will begin in earnest next weekend – eek! It’s been weeks since I picked it up and looked at it – will it be good enough for agents? Will I read it and think everyone is wrong or I’ve written it in the wrong voice? It’s exciting and scary all at once! If you want a sneak preview of the prologue, please see the top page tab labelled ‘sections of my work’. There’s been a lot of things this week that have made me smile, some of them outlined in my blog and some not. Sometimes I do think we people don’t smile enough – so as you drive to the supermarket, or take that daily walk today, see something that makes you smile and do it. Smile at the old man walking the other way – it might be days since someone smiled at him. Smile at the dog walkers, and the other drivers. Smiling releases endorphins – it’s designed to make us feel good. And it’s contagious – if you smile at others generally they will smile back. Spread the joy – I know I will be. This entry was posted in Blog Posts and tagged blogger, crime writing, writer, writing on February 16, 2013 by Kerryrichardson77. Thank you to the lovely Gemma Wilford for nominating me for the ‘Very Inspiring Blog Award’. Gemma has had her first novel, The Ruby of Egypt published and is currently working on her second, Miss Pooshoe. 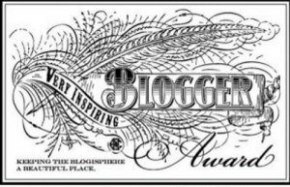 Nominate other bloggers for this award and to them. 1. When I was in my early twenties I was a DJ/Karaoke Compere – I worked the local pubs and clubs, often working 4 nights a week. I was then, and always have been a lover of music – liking pretty much every genre. I also used to work in a local pizza shop. 2. When I was getting fit to apply for the police force, I attended a thai boxing class twice weekly. I’d been going for one month when I dislocated my left knee cap and had a full leg cast on for a month – subsequent to this it dislocated another 6 times meaning I had to look for a new career opportunity – this is how I eventually came to settle on going to University as a mature student to get my Bsc Crime Scene Science. 3. When I was in primary school, I used to hand write small illustrated books about cats for my teacher and staple them together so they looked like a real book. She still had them when I was 16yrs old. 4. I have a disabled brother, Michael who has spina bifida, hydrocephalus and epilepsy – when I was a child I used my left hand to write on the wall under the stairs and blamed him. I owned up eventually but he got so wrong for it! And now you all hate me – but it was just a brother and sister thing! He used to blame me for stuff all the time too! 5. On my first holiday abroad with my now husband, I got bitten by a mosquito and ended up ill for the whole holiday – we had only been together 8 months at this point – he still proposed on that holiday despite my whinging so it all turned out well in the end. 6. I have a bit of a tattoo fettish – I personally have 5 tattoos and would love to have more – I also love looking at other people’s. All of mine were designed by myself, and I have designed several for other people also. I’m particularly fond of tribal designs though I only have one of these myself. 7. It’s a little ironic being nominated for an inspiring blogger award – my posts, as you all know are generally upbeat and hopefully positive and inspiring – what a lot of people don’t realise though is that I suffer from depression, and have done on and off since my early twenties. It has been so severe at times that I have contemplated suicide. I do currently take medication for this. The main reason I remain positive is that I don’t want depression to rule my life, or dictate what I can and can’t do. I have bad days, less often now that I did even 18 months ago, but I always believe that tomorrow is a new day – this helps me cope with how I feel and hopefully provide a little inspiration to others along the way. So now I have done this I would like to nominate the lovely Helen Anderson, and the enthusiastic Chris Robinson for this award – I look forward to your blog posts ladies. Thanks again to Gemma for the nomination. This entry was posted in Blog Posts and tagged author, blogger, writer on February 9, 2013 by Kerryrichardson77. So in an effort to use the blog aspect of the website more and exchange information with all you lovely blog followers, I now find myself with another subject to write about. I have spent the morning networking – there’s a lot to be said for talking to people and making contact. I’m in the process of preparing the plot for book two – and suddenly I realised that there are some things I just don’t have the answer to in my head. So a little reaching out, and a little more research and KAPOW, now it all makes sense. Obviously it’s far too in the beginning stages to tell you all yet – but great that there are people willing to help! Had a lovely meal out last night with a good friend who is director of CSI Training and Events, a company specialising in forensic knowledge, training, lecturing, staff shortage cover, team building events and even hen/stag parties! Both Angela and Dionne are excellent at what they do – give them a look up – their link is on my Useful Links page. Both the meal last night and the networking this morning made me realise just how wonderful people are – human nature is inherently designed to give to others, and most of us do this willingly without charge or question. It’s truely remarkable how much we all want to help other people, how much we are willing to give of ourselves. Yes there are exceptions, as there are in every case – there’s always someone who will give a negative review, or make some bitchy remark. But more often than not it pays to see the positive in people. It’s a choice – the same as those people who choose to do the bad stuff, we choose to be good. I love how unique we all are, from our size and shape, dress choice, humor and looks to how we behave and react to the situations life and the universe throw at us. Every one of us are strong and intelligent, and each and every one of us is important. Sometimes putting this in perspective can feel wonderful. This entry was posted in Blog Posts and tagged author, blogger, crime writer, crime writing, writer on February 7, 2013 by Kerryrichardson77. Is it really February already? What happened and who stole January? That really was a blink-and-you-miss-it kind of month! I’m extremely happy with everything right now – sure there are things I would change (isn’t there always?) but I am content at the stage at which everything is progressing. And that’s just the writing related stuff! It’s very hard to describe the feeling of finishing a novel – I’m sure that other writers out there will agree, whether crime writers or not. There’s a feeling of euphoria – you can’t stop smiling for days because it’s finished! Sadness – it’s time to move onto the next project and let those characters, who you’ve come to know so well, go (unless you’re using them again in the next book). Hope – this is where we hope our editor can help fix our wrongs and help make the book even better, and then we can hope to find an agent and get published. Satisfaction – yes, it’s really finished! Anticipation – it’s hidden away now before the editing can commence, I can’t look at it or read it. There are a multitude of other feelings that I personally have felt and am feeling currently but I will be honest and say it feels great! I’m quite happily embracing all of them, whether good or bad, and acknowledging that finishing book one is a fantastic feat! I had planned to take a couple of weeks off writing, so my head would be fresh for book 2 – but do you know something, I’ve found this just isn’t possible! My good friend and author Victoria J Brown said I’ve ‘fallen into the addiction zone’ and that’s exactly what it feels like! I have so many ideas running around my head and have found myself lost in thought so often that I have had to start my character profiles and research, which subsequently means even more ideas! So I made the decision that if it’s there, and it’s ready to come out, then it must get started. My wonderful hubby Pete did all the cleaning yesterday, and after a nice coffee in town with a friend, I am sitting down and hitting the keyboard! Novel 2 has officially begun! You may notice (if you are a past reader of my blogs) that this is relatively early in the month for me to write my blog – the reason for this is that I intend to write more often (Oh no I hear you all cry – jokingly of course) – my iPad has now been linked with a home screen app so make this so much easier! Finally I would just like to say a quick thank you to all my new followers – either on twitter (@kerryann77) or on my facebook page (K A Richardson) or on here (you can sign up to obtain post alerts by email) – ah the wonders of modern technology! This entry was posted in Blog Posts and tagged author, blogger, crime writer, writer on February 3, 2013 by Kerryrichardson77.